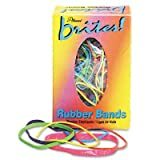 Alliance Rubber Products - Rubber Bands, 1-1/2 oz., BE/OE/YW/LE/PE/PK - Sold as 1 BX - Brites Hot-Color Rubber Bands are color-coded by size for quick, easy use. Feature #16 Blue, #18 Orange, #19 Yellow, #32 Lime, #33 Purple and #64 Pink. Rubber bands come in an easy-to-use dispenser box that fits in any desk drawer tray and helps prevent bands from getting tangled. Rubber bands are sustainable and biodegradable. The Alliance Brites multicolored bands are long and thin. When shooting, you’ll find them to stretch to almost two feet. They are finely cut, and have a nearly consistent parallel cut. In general, this provides for a straighter, more predictable shot, but this is only true for the short events. The thin cut, unfortunately, in combination with the length, results in too much elasticity, reducing the release snap and weakening speed sustained over distance. The length in particular, creates severe air wobble, and the band hits with more of a buckshot effect rather than a sharp rifle hit. This impact dissipation is frustrating, as a band shot will not so much as tip a pop can. These are, however, excellent bands for training use, especially for young shooters who need to learn rubber band shooting safety. They should not be considered competition-level bands. Home offices will be impressed by the Alliance Brites’ usefulness in banding papers. The colors, in my experience don’t stain or hurt documents through over-tautness, but dry rot has occurred in some over the years, and they’ll need occasional replacing.